The volleyball forearm pass is a super important serve receive skill players use to initiate their team's offensive plays once the opposing team has served the ball into their court. Whether you are just learning how to play volleyball or have played for awhile and are having problems with your passing, I suggest you pick one of these elements to work on, one at a time, while you are doing your passing drills in practice. First one of the most important things you want to do is to keep your elbows straight which creates the flat platform you need to control the ball and direct it to your target. If you take a look at volleyball photos of players whether collegiate or professional or beach pros who are in the process of bumping a ball, note how they always work on presenting a nice flat platform by holding their arms as straight as they can while they pass the ball. 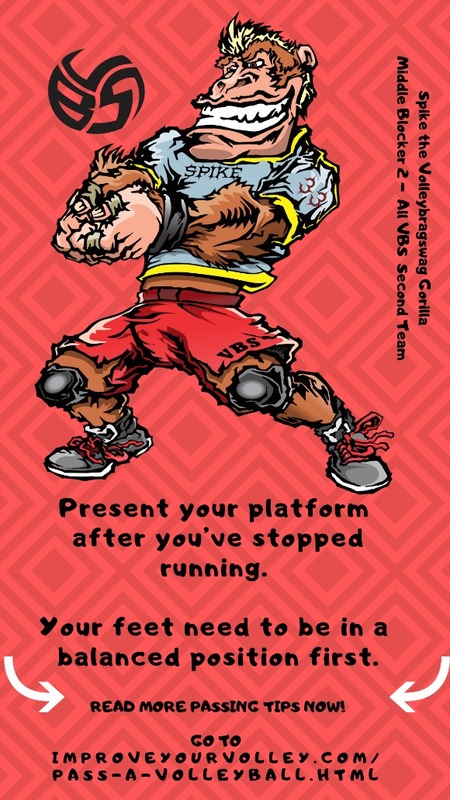 In order to present that straight platform, avoid bending your elbows when you contact the ball. 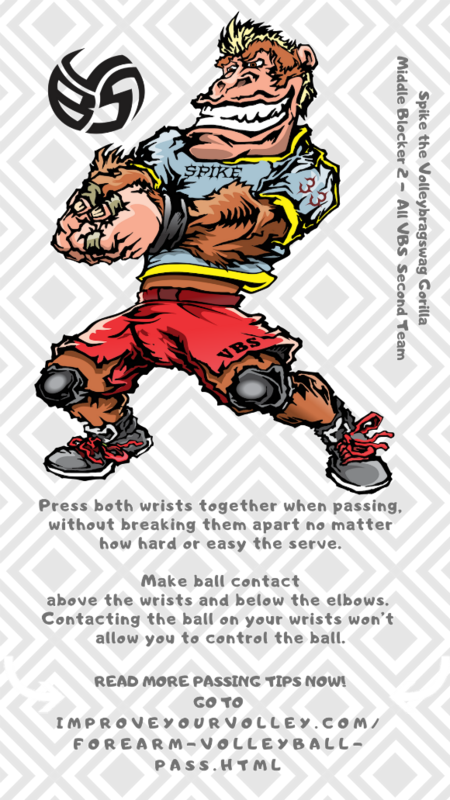 If you pass a volleyball with bent elbows, you will have less ball accuracy and ball control, but by keeping your your arms straight you increase the amount of ball control and improve your ability to guide the ball to the your target. How do you keep your elbows straight? By making sure that when you clasp your fingers together, your thumbs should be pointing to the floor. You should get in the habit of visually tracking the ball all the way into your arms. As a passer, what is the best thing for you to focus on when the opposing team is about to serve the ball? 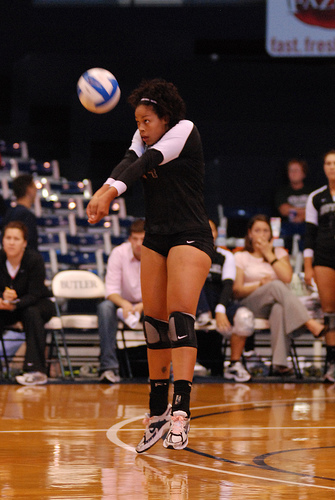 Once the referee has blown the whistle to initiate the play, and the server bounces the ball before she serves it, its at that moment that players should focus on the ball in the server’s hands. 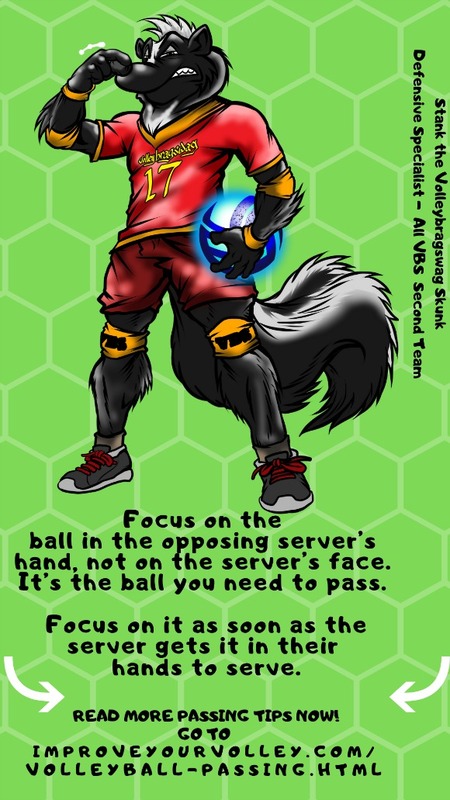 Focusing on the ball while it’s in the server’s hands, then while it crosses the net and keying on it all the way into your platform will help you anticipate where you need to be in order to position yourself behind the ball in order to pass it. If you are an indoor player having a problem with your volleyball passing skills one thing you can do is check to see if you get distracted by taking your eyes off the ball between the time the server serves it and the time the ball crosses the net. Ready position and ready to pass in serve receive. 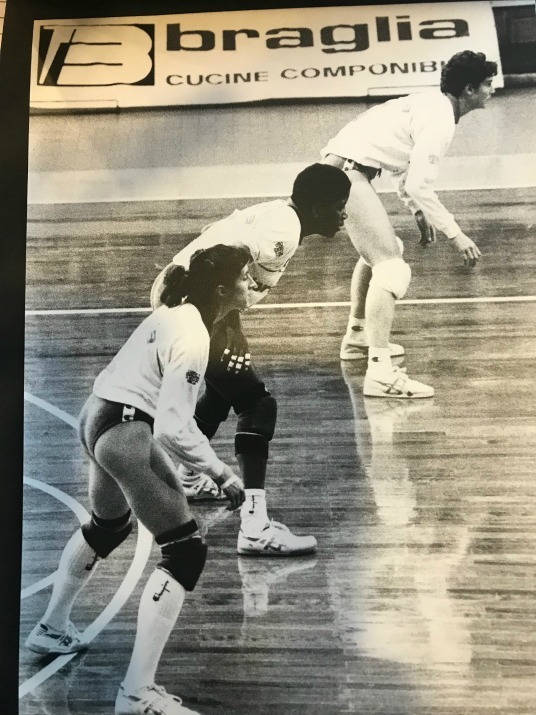 That's me as a professional volleyball player during the Division I Italian Championship match in 1990 when I played in Reggio Emilia for Braglia Cucine. That's three-time Olympian Paula Weishoff and our Italian teammate Cristina Boselli. Notice we are all in a low athletic stance, shoulders in front of our knees, right foot slightly forward. We are focusing on the ball in the opposing server's hand and I can guarantee you we are talking to each other, telling each other to watch for the short serve and who's going to get what. You might be taking too long to begin visually tracking the ball, and if you start tracking it once the ball gets to your side of the net then that's times too late to react to it. That's when you increase your chances of getting aced or shanking the ball because you've moved too late to it. 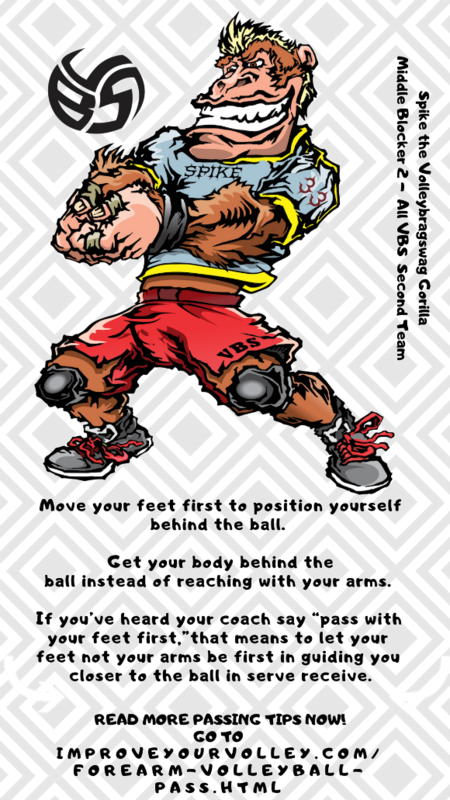 The next thing high school players should remember when trying to improve their volleyball forearm pass is to always keep your arms together without breaking them apart when making contact with the ball. For a period of time while playing college volleyball I was guilty of breaking my arms apart against easy serves and free balls. 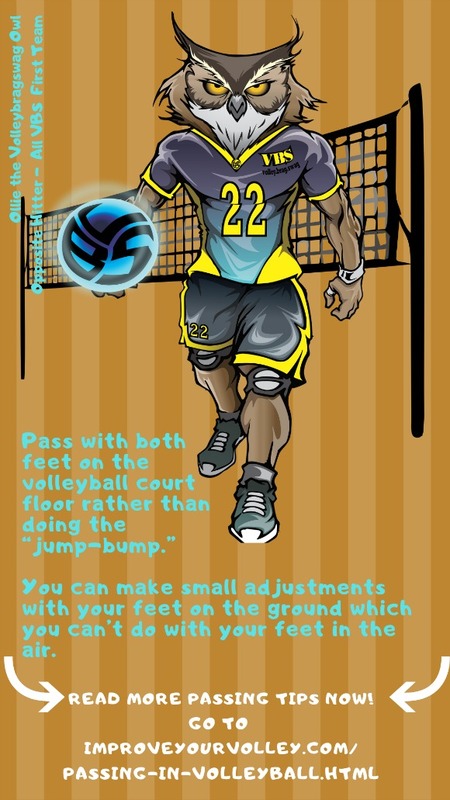 But it’s not a good habit to get into, because sooner or later you’ll find yourself having to pass a jump served ball. The harder the serve, the more important it is to keep your arms together so you can control the ball. 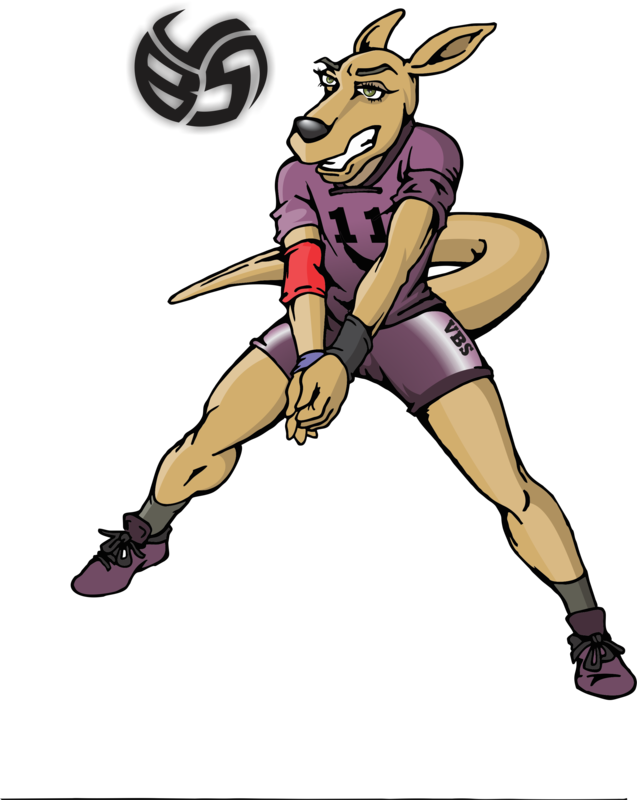 When you bump the ball with your feet in the air, its famously called the "jump bump" and many new players have a tendency to try and 'jump bump" the ball to their target. If your feet are in the air then you can’t change directions or make any last minute or minor adjustments to your body positioning, but if you keep your feet on the ground you have control over your body movements and can adjust to the ball accordingly. The best thing you could do, is to quickly back your body up or open up while staying in a low position which gives the ball a few more seconds and a bit more space to come down where it has less movement in the air and you have more control. So, as much as you can, you want to avoid the jump bump. Lastly, wherever the ball is you want to move yourself to get into position behind it with your feet first. Besides doing passing drills in practice, high school players want to work on foot speed and agility drills. The faster you can move your feet, the faster you can get yourself in the best position behind the ball in order to pass it. 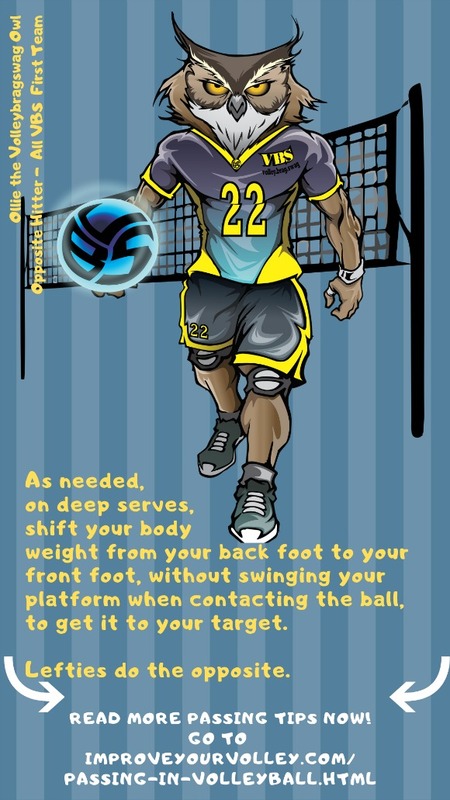 Practicing this type of movement is called foot speed training and this type of volleyball conditioning training comes in different forms. You can regularly do some forms of lower body speed training before you do your pregame warmup drills, where you should do a series of short sprints forward, backward and sideways to help you increase your foot speed and reactive abilities so that you can get behind the ball fast for your passing. Working on these five forearm volleyball tips should help you increase your ball control during your serve receive passing.